Guest Alan Mann (M.A.) lives in the UK. 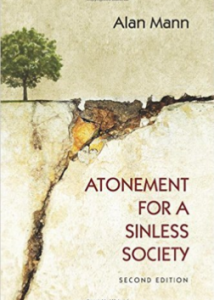 His latest book Atonement for a Sinless Society (Cascade Publishing, 2015, 2nd ed.) explores the gospel for guilt-less Westerners. This post shares his theological journey. For most, this statement was either greeted with nodding agreement or simply forgotten by the time lunch arrived. But for me, it was like a theological earworm. If this assessment was correct, then it had significant implications for the way Christians in the West communicated the central message of the gospel: how was Jesus’ death on a cross an act of atonement? Surely the way we did evangelism fundamentally depended on people accepting they were sinners, right? If no one believed in their own sinfulness, and sin had become nothing more than a sneaky chocolate cookie when on a diet, how was it going to be possible to turn the key of atonement? In the end, I was so troubled by the question I made it the subject of my post-graduate research. While I wasn’t sure of the direction I would take, or where I would end up via this research, I was concerned that I would simply come full circle and admit some kind of missiological defeat — sin wasn’t relevant anymore, and therefore neither was the gospel. To engage meaningfully with the culture I lived in what I really needed to do was lay aside my opinion about what was wrong, and instead listen with a pastoral heart to the stories people told. Only by doing this would I begin to hear the real plight that lay at the heart of many stories in contemporary Western Society. And only by taking this seriously would it then be possible to turn to the New Testament to seek a fresh and meaningful encounter with the stories of Jesus. Western Christians have a story that is too often built entirely around moral misdemeanors, and guilt. However, this is not only a reductionist reading of the biblical text, it is also a rather thin narrative when facing the complexities of what it means to be a human being living in a modern, technologically advanced society. Far better to have a clear vision of what troubled the souls of people, and an equally clear sense of how a compassionate God was able to deal with this plight through the incarnate Jesus. I took some time, but eventually I was overwhelmed with the idea that what was being experienced was shame: a pervasive, chronic, and self-diminishing dis-ease. When one has a clear understanding of what shame is and how it impacts both individuals and communities, it becomes easier to comprehend how Jesus acts both in life and death to deal with it. Of course, the word ‘shame’ isn’t entirely absent from the vocabulary of Christians. The problem is that for most it sits too close to guilt in their mind and so the solution is pretty much the same — recognition and confession that Jesus died to save you from it. What this fails to grasp, however, is that while guilt is something I have done wrong, and can be repented of, shame is the intense feeling that my very being is at fault. This gives rise to a sense of worthlessness and an incessant need to suppress or hide who I really am, creating instead an ideal self that I project out to the world keeping me forever disconnected on every level. This makes ideas of repentance and confession hard to achieve. Those of us who suffer from shame are not seeking a story that tells us we are forgiven for what we have done wrong. Rather, what we need is one that tells us we can be cleansed, healed and renewed within ourselves in order that we can then be restored and reconciled to others – including God. There is a very real missional task facing Christians in the West as we travel deeper into our post-industrialized futures: How does the story of Jesus heal the shame that pervades and destroys our lives? This gives rise to a sense of worthlessness and an incessant need to suppress or hide who I really am, creating instead an ideal self that I project out to the world keeping me forever disconnected on every level. I find the general subject matter of this post curious, and hoped it would address some of my concerns about my sinfulness as a westerner in particular. However, I find the fundamental question still hanging. What has been addressed is shame, rather than sin, as it would appear that the writer does not regard sin as a deep enough concept for an educated westerner. Thus the title seems something of a paradox, an all too tragic irony- yes westerners do not consider themselves to be sinful, but rather too clever or too busy.Thank God that the gospel does indeed address my sin as I go to prayer and the word and will change me! I would ask about the methodology of listening to people’s stories here, and not the Word and the Spirit at the same time. Similarly sin and shame are closely interlinked, and surely one cannot adequately face one without the other.